I’ve been remiss on my blogging, dear reader, and for that I must say, lo siento! But I have been entirely too busy creating the life I want to live! Bahia de Luperon — otherwise known as my backyard until the end of hurricane season! tradewinds to arrive in Luperon, a small village on the northern coast of the Dominican Republic with one of the best hurricane holes in the Caribbean. 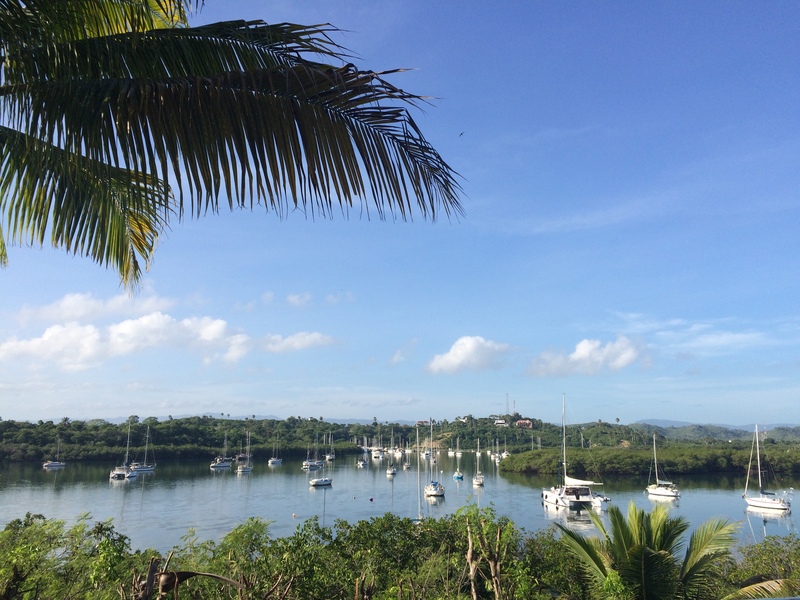 Its little harbour is surrounded by mangroves and mountains, and its bottom is a thick mud that holds an anchor tightly even in strong tropical winds. It was a tough, five-week sail this summer to get here from the Bahamas. Like our anchor, we’ve been settling in ever since. There are about 100 boats in the harbour, and half of them have an international mix of sailors living aboard. These are the “gringos” – of course I am part of this group – and the vast majority spend their days lounging and laughing around the local bars, drinking “jumbo”-sized, 40-oz. Presidente beers that cost $125 pesos, or about $2.77. The beers are so big that they are served in bamboo holders that keep the green bottles cool in the extreme heat of the day. These jumbos, which are pronounced “humbos,” of course, go well with the $125-peso plate of the day, which is usually beans, rice, salad and (if you want) fried chicken. Banana milkshakes (a favorite, especially with a little rum!) is $60 pesos, or about $1.30. It is so cheap to live here; that’s part of what makes this place so attractive to cruisers. 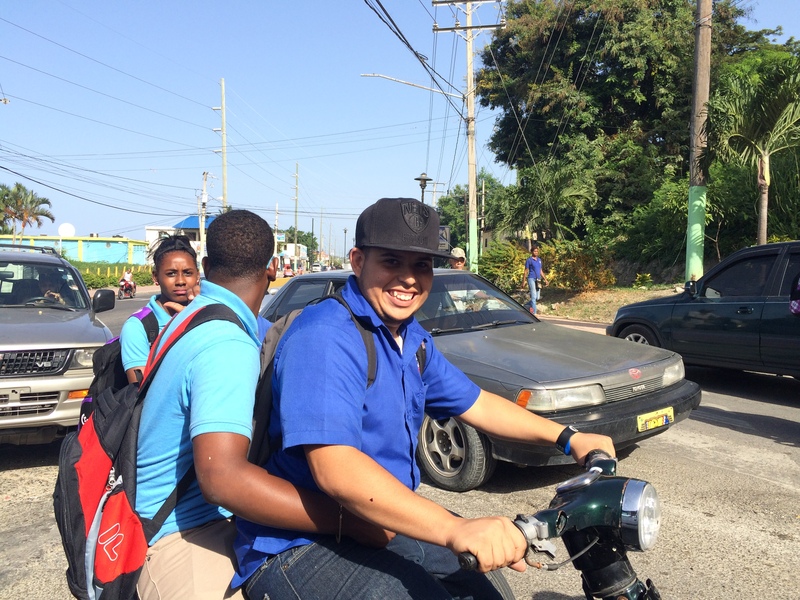 The Dominican people are SO NICE … which comes in handy, since I have the Spanish vocabulary of a 4 year old. dodge the mysterious, neon-green water in the gutters, as well as the stray dogs and chickens that wander around. It’s also a good idea to share greetings and smiles with everyone you pass. I do not speak Spanish well. In school, I studied the less useful French and Italian. If only I had focused on Spanish – life would be a lot easier now! It’s hard to not be able to talk with everyone, to joke around. I’ve been studying Spanish for the last few months, but I’ve got a ways to go. I can almost say basically what I need to, but then the response is usually so fast that I can’t understand it! But I can always understand the friendly people who share a hola hola. Siestas are real, by the way. Starting around 11:30 a.m. to about 2:30 p.m., do not expect to get anything accomplished in town. This is because it is so hot! The weather is pretty consistent: At night, it’s cool. In the morning, the water is glassy and it’s very buggy, with no-see-ums all over the place. By about 8:30 a.m., the tradewinds pick up and it gets quite windy. Soon, it’s very, very sunny and hot. The smart ones stay in the shade until about 3 p.m. Then the town slowly comes alive again, with music pumping and folks gathered outside to share a jumbo or say hola. It’s important to get things accomplished in the morning and then again in the late afternoon, because by the evening, it’s party time. Sometimes the town throws huge bashes in the parque central. A late-night food spot called Come Come sometimes plays 1950s American rockabilly. I recognized quickly that I was one of the only gringos who worked for a living, since most are simply retired. And work I do! I spend hours each day in front of the computer. I am grateful to have a number of clients who hire me to write, edit, do marketing work and brainstorm over the Internet. I am so thankful for Wifi! My mother said when she was in school, she heard about the idea of working anywhere in the world, but she never thought it could actually happen. Well, welcome to the modern age. My Yoga class in pigeon pose. Notice the moldy pillar and leaky roof of the abandoned marina. But the view from the mat is worth a million bucks! 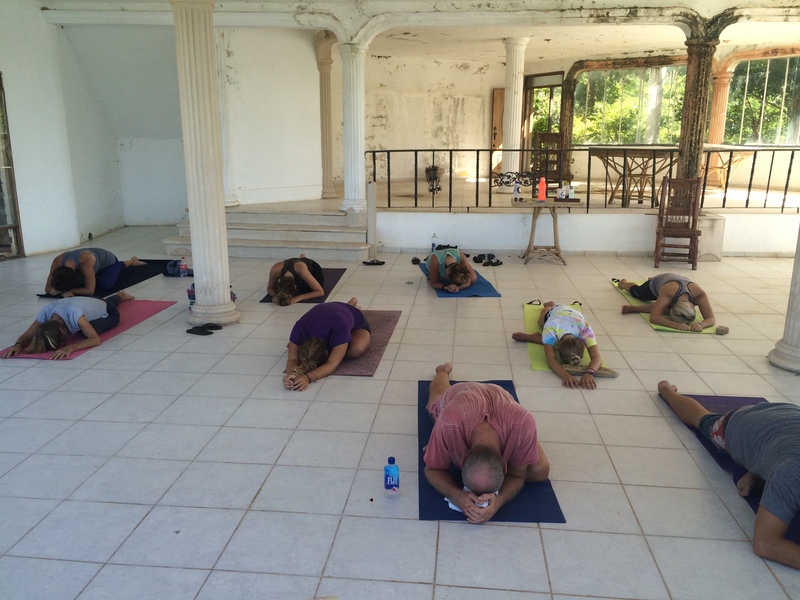 Along with writing and marketing work, I also teach Yoga here in Luperon. I was so excited to learn that there were Yoga classes three days a week in an abandoned marina. I immediately attended, and soon the teacher gave the classes over to me. We average about 10 people or so every class, and I’m blessed that many donate enough funds for a meal or two. Plus, I get to continue teaching and helping people. I really love that. Along with working and yoga, fixing up the boat and slowly but surely planning the next move toward the US Virgin Islands, my boyfriend and I have also been exercising. We’ve taken a few trips into the country, including a cool surf town called Cabarete to which we hope to return soon. But we’re trying to stay within budget so we can keep this life going for a while longer. See, I’ve come to realize that it really is possible to live the life you want. But it doesn’t just come to you. You have to work for it. No effort is wasted! So many people I know feel like they are wasting their lives away. Are you stuck in jobs you hate, in a town you’re bored with? Start planning, and make it happen. The first step is getting out of your comfort zone – a hola hola may be more comforting than you expect!